"Future Seasons" - Stop WAR in Ukraine ! http://twitter.com/@euromaidan - "Future Seasons"
I heard something about the location for future seasons but, at this stage, I'd call it more a rumor than a spoiler: It seems that seasons 36 to 40 will all be filmed in Fiji. So, considering the last three have been filmed there as well as Ghost Island, that would be 8 straight seasons in the same place. What's left of the adventure????? 1. "JP wants Survivor to stay in Fiji permanently"
That is certainly NOT a win for the viewers. Locations were often the theme of the season but now we barely see anything about the local culture. Survivor, as we knew it, is DEAD. Yeah I really miss the exotic locations they used to go to. I don't believe all of Jeff's Reasons! I think the main reason it is much EASIER for Production to stay in Fiji. "our crew has never been as happy. We actually have decent accommodations to do this show out in the jungle." The worst reason he gives is that there aren't many places they can go. Sure, the world isn't as safe as in 2000 but still tourism is way up, The Amazing Race still finds new locations and many places could offer new adventures. For one thing,, why not go back to the best location ever, The Australian Outback? Is THAT unsafe? It is ALL about his own personal comfort and saving money. 5. 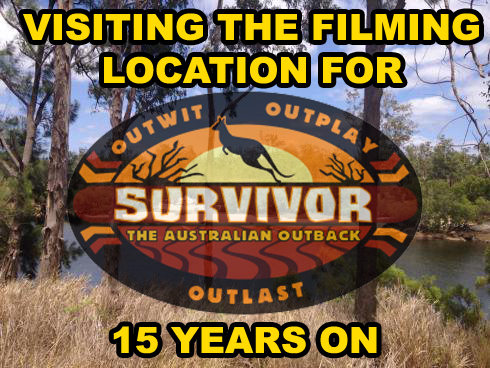 "Outback = Herbert River in north Queensland"
Back in 2000 it is rumored that Mark Burnett paid only $186,000 to allow Survivor to be filmed along the Herbert River at Goshen Station (South-west of Cairns, Queensland, Australia) which it not really the "Outback" and much of that land is privately owned. I would guess if they even wanted to allow Survivor to film there again it would cost a fortune now for the rights. Here's a good article on the location and how very difficult it is to access that location. 6. "RE: Outback = Herbert River in north Queensland"
Do you really think they couldn't afford it?!!! In 15 years they haven't increased the money given to the contestants so they've saved plenty. 7. "RE: Outback = Herbert River in north Queensland"
For my money, I am not unhappy that they stay in the Fijis. It's a really beautiful locale and offers land and sea areas for challenges. Pretty much the same as any other island locale, so why not keep doing it there. So what if the production crew is more comfortable, or that the local government is friendly, or if they save money. That doesn't affect the viewer to any great degree. If fact, if anything, it allows more latitude in challenge designs because logistics are more familiar and easier. The only real variable in terms of what the viewer sees is whether or not it's a land locked location or an island or sea side location, and sea side locations are hands down more attractive IMO. 8. "Same old, same old"
Survivor, the players and the game, used to be mixed in with the season's location, giving it a wonderfully exotic texture. Remember those locals coming to visit and giving instructions as part of the reward, or when the players visited the Great wall of China, made camp on the Mayan pyramids. All gone just for their little comfort and their huge profits. I truly feel cheated. 9. "RE: Same old, same old"
That's just being a bit petty, don't you think? There's plenty of amazing things to see in Fiji, and it's a wonderful place to serve as a Survivor stage. And even if they are doing it for profit and to allow the production crew to be more comfortable, so what? You begrudge them a profit (which you should recognize allows them to exist in the first place - we don't exist in a socialist society so extreme that profit is a valid basis for criticism, I hope) and some comfort? Really? Fiji still allows a mix of land based challenges, variable weather, and more complex challenges, so relax, chill. Unless you are just looking for things to complain about. Personally, I like the seaside locations better because of the water challenges. And the main complaints I would have are about the casting choices, specifically when returners or BB castoffs are chosen. 10. "RE: Same old, same old"
They've made profits every season so this is just about making MORE profits at the expense of our enjoyment. Yes, Fiji is nice but we barely see any of it. Fiji is nice but would you vacation there every time if you had no budget restrictions? Of course not. Australia, Kenya, Guatemala, China, Gabon and Tocantins have all given us great scenery even without beaches. Survivor used to be an adventure now it's reduced to a game. They may as well film it in Burnett's backyard. 11. "RE: Same old, same old"
So you speak for "long standing fans"? Presumptive as well as petty? I'm sure there are some, even some who call themselves purists, that would agree with you. There are as many opinions as there are fans. As my own kind of purist, I appreciate the underwear/bikini seaside seasons more than the grungy land locked seasons. Much better optics, and I'm sure that's a major selling point for TV ratings. And also why no US seasons so far have been in Northern locales. 35 years, and only 6 landlocked examples? I'd say they gave it a try and appropriately decided, probably based on audience surveys, that the tropical island locales had more appeal and produced better shows. And the examples you use for historic scenery appeal can be found on many travel sites, why is it incumbant on Survivor to always include them? Are you saying you didn't mind the earlier profits, but now you complain about the even bigger profits? And the fact that they use some of those profits to make it a bit more comfy for Jeff and production? Did I mention petty? 12. "RE: Same old, same old"
I'd avoid insulting me for being petty when you include a remark about bikinis in the same post!! I simply included 6 of my favorite seasons that where held in continental seasons but there have been more. I forgot to mention Amazon, my favorite of all and we also had Thailand, a couple in Nicaragua and another pair in Cambodia... Yes, tropical islands work well with the shipwreck theme but not 8 times in a row in the same locale. I do mind them making profits at the expense of my enjoyment; is that hard to understand? I feel like I'm watching a substandard program. 13. "RE: Same old, same old"
What's petty about bikinis? They do make the show more enjoyable. I'll defend them to the death. We do have a history, but basically, I think you just can't quit contradicting me. 14. "RE: Same old, same old"
Bikinis are of small importance. Fun, yes, but an extremely shallow way of appreciating the women on the show. I was the original poster, expressing my opinion about returning over and over again to the same location. It seems that YOU had the need to come in to contradict me. 15. "RE: Same old, same old"
I had an opinion. It happens to be different than yours, so I expressed it. These threads are, as you yourself stated, places for these debates. But it seems that I either totally agree with you, or you have to keep debating what are what I hope you recognize are subjective opinions. Let it go. Reread our posts throughout, you will see that I actually agreed with you on some points. But you never backed off of disagreeing with my points. So you have your opinions too. Again, just accept that we disagree sometimes, and let it go. I like Fiji, and you don't. Why get worked up over that? BTW, you can't even agree that bikinis are a key selling point to a large portion of the wider audience. But you must know in your heart of hearts that that's true, I think. So if there was ever a stellar example of blind intransigence, that might be it. 16. "RE: Same old, same old"
You really don't get it do you? This has nothing to do with liking Fiji or not, this has to do with missing out on the rest of the world. There are many countries that aren't sh*tholes! This is about the adventure that Survivor once was and becoming simply a search for idols and strategy talks with absolutely no connection to the location. You don't even get the bikini comment! It's not that I don't appreciate a beautiful woman in a bikini but you were accusing me of being petty in a post where you brought up bikinis as a good selling point for you. That was a very shallow opinion so I was pointing out who was actually being petty. PS. They had bikinis in landlocked areas also: You must remember the girls of the Amazon while Tocantins had, in my opinion, the most beautiful group of women ever. 17. "RE: Same old, same old"
18. "RE: Same old, same old"
19. "RE: Same old, same old"
I have had to give up all of that! However I'd rather have Survivor with all it flaws then not to have Survivor to watch and talk about in forums like this! 22. "RE: Same old, same old"
I'd cut the list down to the voted off items and the twists and idols. And maybe the reunion thing, I do miss that. But if this were a negotiation, I use the other items as sacrificial chips to get the important stuff. FTR, I think any notion that a booted survivor could return is a bad idea too. 23. "RE: Same old, same old"
Absolutely. That used to be the first thing we'd do: Look at the Survivor Maps site to figure out the new area then, when episode 1 started, we'd look at the new scenery, imagining that we were there and it was our adventure. Now, Fiji is old news. It is the ideal number to have a good game while still getting to know everyone. I'd like them to go 6 days before voting out the first player. Make it a real double episode so that everyone gets airtime. Some recruits have been very interesting. The players should know the rules of the game. How about NO idols! Or maybe have them good only for a limited number of TCs. In her fanfic, Estee had a new idol good only for the upcoming TC and maybe I'd like that but only if the hunt for the idol wouldn't take half the episode. The Final three is an abomination. Why fly them in if we don't get to hear from them? They are there only for the live audience. 20. "Survivor Staying In Fiji… Forever?" Survivor Staying In Fiji… Forever? Jeff Probst reveals that he wants Fiji to be the permanent home of Survivor going forward. It looks like Fiji is set to become the permanent home of Survivor, at least if Jeff Probst has anything to do with it. For the past four seasons, the long-running reality-series has filmed in Fiji’s Mamanuca Islands – including the upcoming Survivor: Heroes vs. Healers vs. Hustlers and next year’s Survivor: Ghost Island. The exotic location has proven so successful that the show may just be staying there indefinitely. “I hope we stay here forever,” Probst told EW‘s Dalton Ross, referring to the Fiji location. It’s not the first time the Emmy Award winning host has shared this sentiment, during a live Facebook Q&A last year, Probst said that Fiji “is the ideal Survivor location” and that “if could go there for the rest of Survivor career, would sign that deal right now.” The reasons Probst is so high on Fiji is because of what it offers not only in terms of filming logistics but in the ease of working with the local government. For years Survivor bounced all over the globe, everywhere from the Australian Outback to the Brazilian Highlands to the Plains of Africa, providing each season with its own unique landscape and cultural feel. But in 2009, in an effort to cut down production costs, the show began filming two seasons back-to-back in the same location. Countries such as Samoa, Nicaragua, and the Philippines have been used on multiple occasions, but Fiji’s Mamanuca Islands is the first location to be used for four consecutive installments (they shot four seasons in a row in the Philippines but in completely different areas). The latest news seems to confirm Inside Survivor’s earlier speculation about seasons 37 and 38 filming in Fiji. The Mana Island Resort, which houses production crew during filming, is once again booked up from March 2018 onwards. UPDATE 12/27/17: An article posted by the Fiji Times on November 2 appears to confirm that Survivor will remain in Fiji for the foreseeable future. 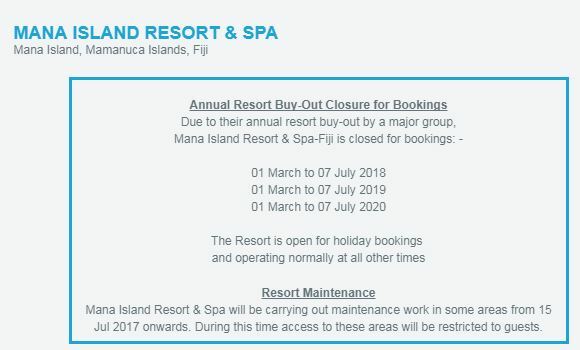 In the report, Mana Island general manager Patrick Wong states that the resort has been fully booked by television production crew for both 2018 and 2019. That would mean Survivor is staying in Fiji until at least Season 40, which would film during the summer of 2019. This means Survivor intends to stay in Fiji until at least Season 42, which would film in summer 2020. What do you think about Survivor staying in Fiji? Let us know in the comments. 21. "RE: Survivor Staying In Fiji… Forever?" As I've posted previously, I'm OK with it. I'd be OK with any calm water tropical island/seaside location too, and less OK with most land locales not near water. Mainly because water challenges have become such an integral part of the show. And because one tropical island locale pretty much is the same as any other, give or take the odd volcano. (Edit: after reading today's news, I'd also exclude tropical island locales where they test missles and bombs. Cannibals and infectious diseases are ok, just not the fireworks). But on a side note, this has got to be good news for Fiji in general (increased revenue), and for the Mana Island Resort. Solid bookings are a godsend for these places and for the other tourist facilities because of the traffic generated. But it’s bad news for regular Fiji tourists, prices will rise. Being a fixed target might make spoiler's jobs easier, I guess this is a negative.